Kolkata: A clay model resembling a doctor and taking money in the crowd puller Mohammed Ali Park Durga Puja pandal recently triggered protests from the medical fraternity prompting the organisers to put up a notice that the model represents ‘fake doctors’ only. Medical Practitioners from the state were outraged, when they came across a depiction of clay idol of an ‘asura’ (demon) as a doctor. The marquee of Mohammed Ali Park Durga Puja showcased a demon in the garb of a doctor — with a doctor’s white coat and stethoscope — taking money from patients. The model donning a white apron and a stethoscope had been kept beside ‘mahisasura’, the buffalo demon slain by the goddess. The depiction immediately drew response from the medical fraternity protesting the maligning of the medical profession in puja decorations. The organisers were quick to respond that the pictures depicted the menace of FAKE doctors and not real doctors . “Doctors have been assaulted, harassed and insulted enough. Now, this is the last straw. Depicting a doctor as an asura will provoke hatred against them. We demand immediate removal of the idol or we will launch a state-wide agitation,” said one angry medical practitioner to TOI. The organisers immediately put notice board before the model which read ‘Hatred for fake doctors who are like demons and Respect for the real doctors”, finally to take it off after CM Mamata Bannerjee’s Intervention. “The Chief Minister called me up to request removal of the model. In accordance with her wish, we are not placing any idol in a doctor’s attire,” said Dinesh Bajaj, later told IANS. Indian Medical Association (IMA) member Dr Sajal Biswas said, “Durga puja is a festival of harmony where lakhs of people assemble. Such a model will create wrong impression about doctors who share a unique, human bonding with patients. A clay model resembling a doctor and taking money in the crowd puller Mohammed Ali Park Durga Puja pandal has triggered protests from the medical fraternity prompting the organisers to put up a notice that the model represents ‘fake doctors’ only. The model donning a white apron and a stethoscope has been kept beside ‘mahisasura’, the buffalo demon slain by the goddess. 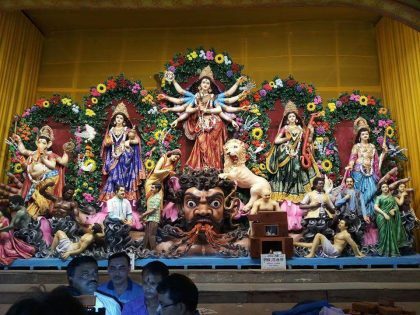 Bajaj, however, said that the issue has been sorted out with the IMA and Medical Council of India that had contacted the organisers to seek assurances that the medical profession would not be maligned in puja decorations. It is very unfortunate to note that you have portrayed Doctors as a symbol of Mahisasur in the idol of your Puja Pandal. We think you have forgotten that Medical Profession is the noblest profession and even the members of your Puja Committe do also go to the Doctors only to get cured when they themselves & their near ones become sick. As your Puja is a popular one , we think you have tried to build up an Anti Doctor opinion amongst the Society at large intentionally. The largest Medical Organisation of the World, Indian Medical Association has taken up the issue very seriously & we demand you should rectify the same & apologise in public in no time, otherwise you get ready for the worst possible consequences as the Medical Fraternity will leave no stone unturned to take all possible measures against you if it is not done by Saturday. Hope your good sense will prevail. Wish you a good Mental & Physical Health. This attitude explains why medical care in WB (incl Kolkata) is in the dumps. Can Kolkata compare with even tier II cities. No. The attitude is lock up the Doctor and throw away the keys. Most richer Bengali\’s head for other places for medical care.